Simon is a hat. A tam, to be exact. Made for people (like me) with lots and lots of hair to shove under there. Or just for people who like big, floppy hats. It’s named after a character from the television show Firefly, because his last name was Tam and I couldn’t think of the word without thinking of him. 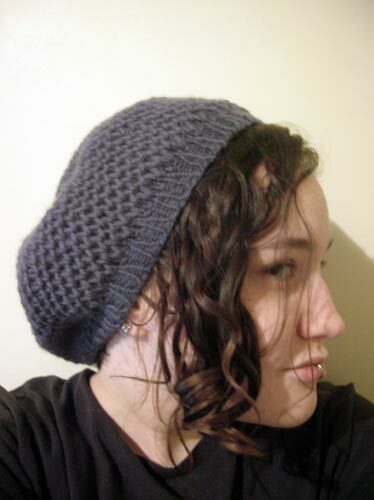 Finished size: 18″ around ribbing, unstretched. -The stitch pattern looks ridiculously complex, but it is actually quite intuitive and easy to memorize. It does take a while to appear the way it’s supposed to, so don’t freak out (like I did) if it looks weird for the first couple of rounds. -sl1YO is worked as follows: sl1 wyif, wrap yarn over needle back around to the front of the work. YO will rest on top of the slipped stitch. 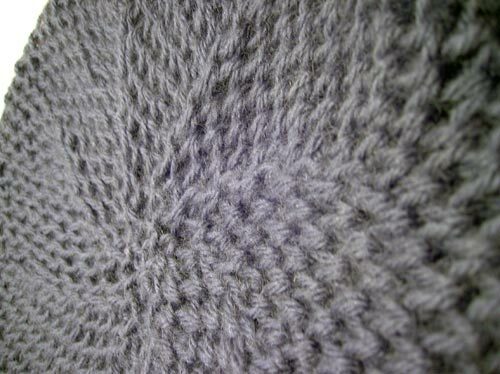 -For purposes of the decrease and finishing sections, YOs do not count as stitches. -The nature of the stitch pattern leaves a small seam at the beginning of the round. 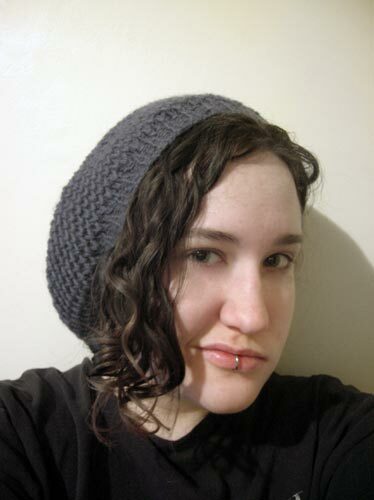 I hid it by leaving a very long tail at the top of the hat and weaving it through the stitches on either side of the seam to mirror the diamond pattern that covers the rest of the hat. The seam is virtually invisible on its own, however, so it’s your choice whether or not to hide it completely. Using smaller needles and a tubular cast on, CO 78 stitches. PM and join, being careful not to twist. Work K1, P1 ribbing for one inch. prep rnd 2: *sl1YO, p1* repeat to end. patt rnd 1: *k the st behind the YO, sl YO pwise wyib, k1,* repeat to end. patt rnd 2: *p st tog with the YO over it, sl1YO,* repeat to end. patt rnd 3: *k1, k the st behind the YO, sl YO pwise wyib,* repeat to end. patt rnd 4: *sl1YO, p st tog with the YO over it,* repeat to end. 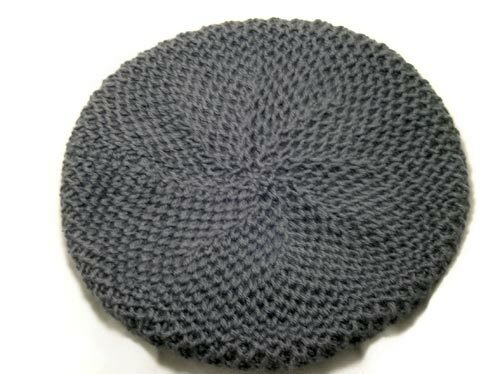 Repeat patt rnds 1-4 until hat measures 6.5 in. from cast-on edge, end row 1.
marker rnd: *(p st tog with the YO over it, sl1YO) six times, PM,* repeat seven times, *p st tog with the YO over it, sl1YO,* repeat to end. dec. rnd 1: *(k1, k the st behind the YO, sl YO pwise wyib), repeat to three sts before marker (note that YOs do not count as sts.) On these three sts: sl2tog, k1, psso, all underneath the YOs, leaving the YOs on the lefthand needle. Slip both YOs pwise wyib,* repeat to end. dec. rnd 2: *(sl1YO, p st tog with the YO over it), repeat to one st and two YOs before marker. Ptog st and YOs,* repeat to end. dec. rnd 3: see pattern rnd 1.
dec. rnd 4: see pattern rnd 2. Repeat dec. rnds 1-4 5 more times (6 repeats total), switching to DPNs when necessary. Remove all markers other than the one at the beginning of the round on last repeat of rnd 4.
finishing rnd 1: *k1, sl2tog, k1, psso, all underneath the YOs, leaving the YOs on the lefthand needle. Slip both YOs pwise wyib* four times, end k1, k the st behind the YO, sl YO pwise wyib. finishing rnd 2: *sl1YO, p st tog with the two YOs over it* four times, end sl1YO, pst tog with the YO over it. finishing rnd 3: *k2 sts tog with one YO* to end. Break yarn, leaving a long tail. Draw tail through remaining stitches. Weave in all ends on the wrong side. Block over a dinner plate or a plastic bag stuffed and shaped into a flattened sphere.